As a photographer, Robinson became enthralled with the work of Henri Cartier Bresson at the 1947 exhibition of Bresson's photography at MoMA. Like Bresson, Robinson composes entirely through the lens, disdaining cropping or other manipulation of his negatives or prints. Robinson also admires the work of photojournalists Robert Capra and Paul Strand; Jacob Riis, who used the art for social reform; and the portraits of place by Andreas Feininger, Eugene Atget, and Edward Steichen. Another major influence was his friend Gene Fenn, photographer, painter and American expatriate living in Paris. 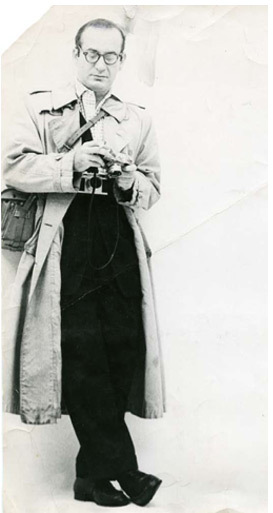 Fenn was an assistant to Louise Dahl Wolfe, the celebrated fashion photographer of Harper’s Bazaar. The highlight for Robinson’s many European trips were the photo shoots with Fenn, exploring Paris with their cameras. Robinson’s daughter Kristin, a fine arts photographer, who accompanied him on many shoots, still recalls him racing across a street or scrambling up a hill for just the right vantage point to frame his picture. Robinson's trips in the 1950s and 1960s to Europe, Africa, and the Far East, further excited his passion for photography. A 35 mm Canon and Rollei reflex have been his constant companions ever since. Robinson's first exhibition, “Color Photographs from Seven Countries,” was held at the SVA Gallery in 1946. His articles and photographs have appeared in major photography journals.